Ready to make a bold career move with a big payoff? Our Master of Arts in Organizational Leadership (MAOL) – Healthcare Management will prepare you for a successful health administration career. You'll gain expertise in healthcare law, best practices and how to manage change – all from a Christian worldview. Command an often-six-figure salary as you fill the strong need for healthcare administrators with leadership expertise. 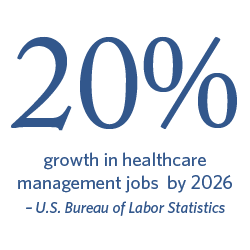 Ensure better care for patients as a critical decision maker in the healthcare industry. Develop insight on how the healthcare system operates –and how to navigate changing legislation. You will practice solving problems through collaboration, communicating effectively in actual leadership situations, and conducting research and presenting findings on contemporary issues. Assess an organization's environment and develop and implement strategic plans for the organization's growth and its growth. Ethically address the intersection of race, poverty, gender and health with the goal of implementing positive healthcare solutions. Apply healthcare law, forensic medicine, medical malpractice and other fundamental legal principles of healthcare management.